It is the dead of winter and all I want to do is drive my s2000 and improve it... but I keep it hibernating until the end of April. and at the provided 14min mark the reviewer details the virtues of the AP2 04-05 ABS module over the AP1 00-03. The ABS system has been improved through the use of split-regulation yaw-control logic for improved stability on split-μμ surfaces when the ABS is triggered. Furthermore, though more powerful than before, the system (consisting of the CPU and modulator) has been downsized for both precious space and weight savings. The anti-lock braking system (ABS) is a compact type that incorporates the solenoid valve, motor and ECU into the modulator body, thereby saving both space and weight. The ABS system is a four-sensor, three-channel system with a speed sensor located at each wheel. There is a separate channel for each front wheel and the rear wheels share a common third channel. This is a "select-low" system, meaning the system controls both rear-wheel slave cylinders together when it senses incipient wheel lockup in either wheel. The system uses the memory capacity of the system's Electronic Control Unit (ECU) and allows the system to better estimate vehicle speed, which gives it better control in the lower-slip range. This contributes to superior braking efficiency and stability. For the 2004 S2000, with improvement of both hardware and software in the compact ABS modulator, memory capacity has increased and new program logic has been added which enhances braking efficiency and reduces the weight of the system. It looks like the modulators are a straight swap from AP1 to 04-05 AP2. 06-09 AP2 has VSA and that's way more complex and involved to swap in. From an 01 to an 05 spec, the modulator uses the same pin out for the coupler and the same wheel speed processing speed (they're common from 00-05). As long as the ports are the same, which I didn't check, you should just be able to bolt in the 05 modulator and connect the brake lines. Slightly encouraged, I just decided to buy an 04 ABS module on eBay for $60 shipped with all brackets included (Honda's price is $1776!). I also picked up the 2 brake lines for $20 to account for the '04 ABS module's different location for the inlets from the master cylinder (46374-S2A-A60 , 46375-S2A-A60). At $100 the most expensive related purchase was the 00-04 s2000 service manual (meant to validate the 3 extra pins on the '04 ABS module's 25P connector aren't actually used) -- probably should've opted for the 04 electrical service manual... but maybe others on s2ki can help validate that those 3 extra pins on the '04 ABS module aren't actually used? Anyone aware of something I'm missing that makes this 02 to 04 ABS module upgrade a non-starter? Last edited by snitm; 02-09-2019 at 08:20 AM. I don't have any answers for you, but great post. I'm subscribing and eagerly waiting responses (and follow-up to your research). Wow, really cool.....From what I gathered it seems that the processing capabilities of the ABS module internally are enhanced both logic-wise as well as mechanically, but electrically they're the same. I did some digging myself and the pinouts for both connectors are exactly the same, even though there's extra pins on there, your suspicions were confirmed that they're not used. I used this as reference....This should definitely be a sticky all over this site, it has basically everything you need regarding s2000 information, and then some. 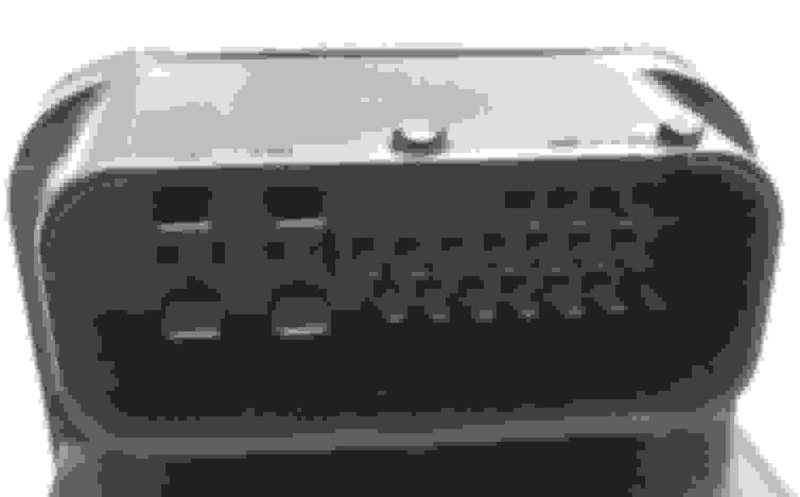 So, digging through the 2000-2003 and 00-08 service manuals, starting with the 2000-2003 service manual, go to section 19-39 & 19-40, shows the 25 pin connector and all related pinouts (upside-down oriented to how you have it in your pics). 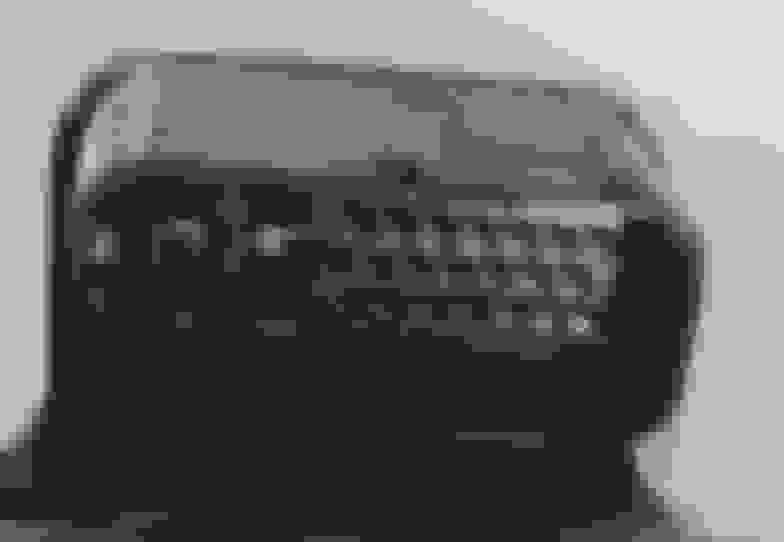 Next, go to page 19-31 in the 2000-2008 manual. It lists the ABS Components index for ('00-05 models) and includes the circuit diagram and troubleshooting etc. under that, which to me means that they must share the exact same pinout, and like you said before, the logic processing of the unit has been enhanced internally and mechanically, while still remaining the same in terms of electrical operation. OEMs have extra pins all the time that aren't used depending on the domestic market of the vehicle, some features are added or removed, but to save on cost and simplify part numbers, sometimes wire harnesses and components are pinned to accommodate accessories/features that aren't present and/or supported in the vehicle depending on region, trim, etc. Anyways, going to 19-39 & 19-40 in the 2000-2008 manual it lists the exact same pinouts as the 00-03 manual for the 25 pin ABS connector. 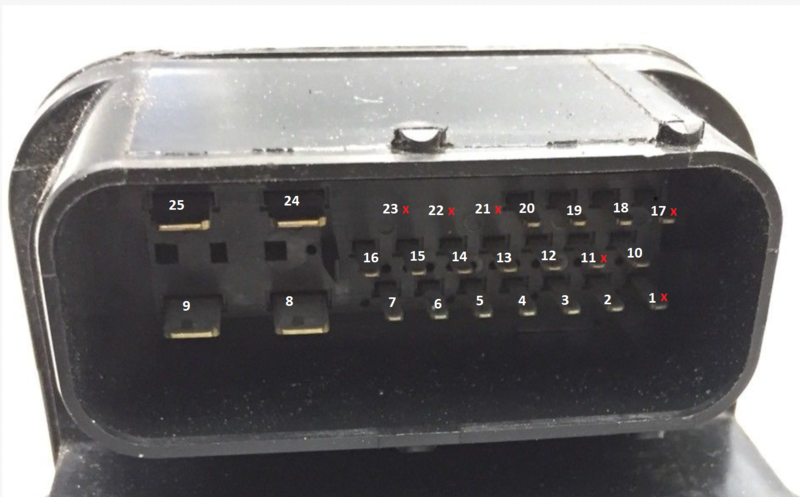 Here's your picture of the AP1 connector with all pins identified in relation to the diagram if orientations lined up, the ones not used have an "x" notation, and even though pins 21-23 are present on an AP2 connector, they're still not used as well. Unfortunately I don't have any further information regarding the unused pins except by what the service manuals tell me. But regardless, excluding the 06-09s which are indicated to share the same components (albeit with different part numbers for the ABS modules (00-03, 04-05, 06-09) and some hard lines / brackets (04-09) they all share the same pinout and function for ALL model years. Given that the 00-05 models still operate without any additional computer nannies and share the same pinout and layout, I can only concur that the changes that you mentioned are indeed true and are simply limited to how the module operates and the logic behind how it processes information ie. revised from the 00-03 models. The AP2 seemed to take a lot of lessons from the AP1 in terms of ways to operate not only more predictably, but more efficiently. With that said, I'd say that with the improved operation function and logic this will definitely be a bolt-in upgrade. How noticeable? Who actually knows. Worth a shot though....the only real way to gain real-world results would be to do back-to-back testing between modules and in conditions where any improvements and/or changes in braking characteristics would go noticed, so it would have to be on the same track or closed circuit with an experienced driver. All in all super interesting....sorry for the long post, I've got some time on my hands at work tonight, and stuff like this is definitely intriguing, especially because there's quite a few parts that people swap over from the AP2 to the AP1 as a straight upgrade, this may be yet another thing worth looking into! I decided to say screw it and ordered myself a setup as well. Got it for $50 shipped off of ebay, and it includes the module, bracket, master cylinder, and the 2 hard lines that you mentioned that are different from the AP1 still attached. Looking at the parts diagrams between the 02 and 05, the master cylinders share the same part number, so it just seems like the ABS module is mounted slightly different like you said, but the hard mounting points for the bracket to the chassis are the same it seems. From the looks of it, the 04 and up have a revised mounting setup that include much larger rubber dampers mounting the module to the bracket, and 3 of them as opposed to only 2 for the AP1. For under 100 bucks overall it's worth checking into on a weekend I'd say! Last edited by Kyle; 02-08-2019 at 12:25 AM. I'm just curious what you find lacking with the ap1 abs system? Thanks so much for looking through all of your resources to confirm my suspicion/hope! Yeah, I was very happy to find that the ABS module so cheap. My line of thinking on it is: Honda engineers put a lot of time and effort into these upgrades, so if it is basically just a drop in to upgrade then it is totally worth it to try. Hopefully this ABS upgrade will pair well with my AEM Infinity that has Traction Control configured (the AEM traction control reduces timing and causes the engine to back off if it feels wheel slip.. as determined by wheel speed difference between rear wheels' VSS and the front ABS wheel speed sensor). I don't have a critical opinion of my AP1's ABS (I can always fall-back to it if for some reason the AP2 ABS somehow falls short). But given my appreciation for the engineering it'd take to package the AP2's upgraded ABS and the judgement of the YouTube reviewer I linked to (who I've grown to really respect based on a handful of his reviews I've watched recently): I'm just able to accept that the AP2v1 ABS module is more capable than the AP1. As an engineer I know when to accept a solution as a worthy improvement to try for myself. As a driver I've autocrossed a few times but am _not_ very fast nor do I fully understand proper driver technique; I lean on others who have more experience to setup my car to give me the best chance to have a pleasant experience growing as a driver -- and not getting myself in harm way to the point of compromising my ability to provide for my family or something. In short: I have a 2.4L with custom intake, IM, exhaust header, exhaust and differential. I'm just trying to get the best experience out of the platform, improving safety if/when driving at the limit. Hoping some more esteemed members of the community catch wind of this thread and can come in here to chime in on this potential upgrade. I'd be interested to hear the opinions of others on this, and how it could realistically affect the braking characteristics for the better in real-world scenarios. I know this is asking too much, but with how thorough both of you posters have been... It would be great if we could get some real-world, same-day back-to-back testing of the AP1 ABS prior to swapping in the AP2 ABS. I'm not even sure what you'd test -- stopping distance for a full-on panic stop, pedal feel (? ), and perhaps the feel of trail-braking? I truthfully don't mind making small investments for science! I'd be more than willing to send the setup to someone who's experienced and have them weigh in on it. They can keep it too. If a long-time track expert is interested I'd be more than happy to send them the components on my dime so they can weigh in on it if they're interested. If anyone is down for that reach out, I'd be more than happy to facilitate it and would love some input and data. Last edited by Kyle; 02-08-2019 at 10:53 PM. Have you managed to fit the pump yet? Mine has failed so looking for a replacement (03) but if this fits with the new brakets and some new lines then i may well go this route! I haven't gotten my car out of winter storage yet. But I'm pretty confident it will work fine.